The rules in the village are simple. When you reach the age of 70, you must go up to the top of Narayama mountain and wait there until you die. "The Ballad of Narayama" is about an old woman whose time has almost arrived, and who is determined to take care of her family's unfinished business before she goes to the mountaintop. Most of that business concerns finding wives for her sons. Stated that simply, "The Ballad of Nayarama" sounds like humanism crossed with anthropology, sort of a "Woman in the Dunes" (1964) about death. But this movie is much more passionate than I've made it sound: darker, bloodier, more fearsome. It was directed by Shohei Imamura, whose films deal with the ways we pass laws to govern our deepest impulses, and then are driven to break those laws. We see a poor village in the mountains, many years ago. It is a beautiful setting, a postcard, but life is raw and hard. The people work the fields in their bare feet, plowing the land and raising only enough potatoes and rice to barely feed themselves. Everybody knows everybody else's business. That is particularly true of the old mother of the most important family. She is tireless, stubborn, willful. She wants to find wives for her sons. She turns up one wife - a new widow from across the valley - and shares her favorite recipes and the secret places in the river where you can catch fish with your bare hands. But this new wife turns out to be not quite the catch she seemed. Meanwhile, another son, a universally scorned and hapless man known as the "stinker," creeps about the village, eavesdropping. He learns that a dying man asked his wife to sleep with every man in the village at least once. This seems to be the stinker's chance, but it's not: The dead man's spirit turns into a butterfly that returns to advise against the stinker. Another son makes love with the daughter of a neighboring family, and gets her pregnant. But then the girl's father is exposed as a thief, and, in the movie's strongest and most painful image, the entire family is buried alive as punishment. The final passages of the film have the oldest son taking his old mother up to the mountaintop. She is not sick and she is not about to die, but she is a woman of great determination and she demands to go to the mountaintop. 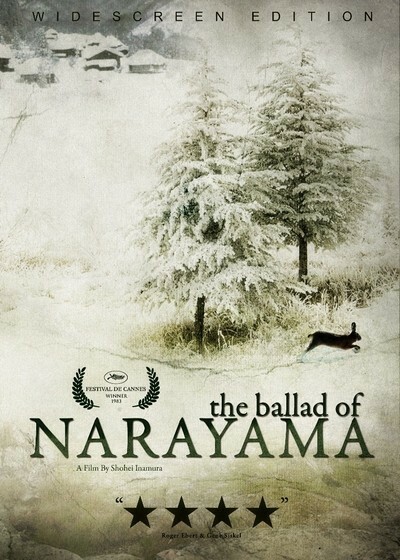 "The Ballad of Narayama" won the grand prize at Cannes, but it's not the sort of film that becomes a hit, even on the art film circuit. It's too introspective, too unblinking in the face of cruelty, too "Japanese." That makes it all the more a fascinating experience. Dear Roger: I Can't Believe Our Film Festival is Twenty Years Old!